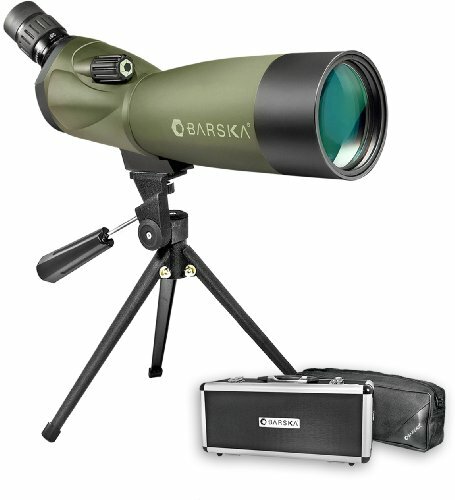 Discover everything you need to know about the Barska Blackhawk Spotting Scope. We take a close look and give our honest opinion. If you’re looking for a decent mid-range spotting scope while you’re out in the field, the Barska Blackhawk Spotting Scope is worth consideration. Compact and portable yet offering decent levels of magnification, it’s the ideal piece of equipment for outdoor pursuits including hunting, birding and wildlife watching. The Barska Blackhawk joins a long line of binoculars and monoculars produced by Barksa over the years. Offering a pedigree to outdoor enthusiasts, Barska has a reputation for manufacturing top-performing equipment that doesn’t break the bank. So, how does the Blackhawk stand up? We take a closer look at what it’s got to offer. Although you should never base your decision about whether to purchase a spotting scope based on what’s in the box, it’s nice to know whether the model comes with any accessories. On this occasion, the answer is yes. Barska is more than generous with the extras they’ve thrown in with their Blackhawk scope. Pretty impressive or what? It’s certainly nice to have a whole bunch of extras and the choice between using a soft or hard case is great. The only unfortunate factor is that the tripod is of distinctly dubious quality. In fact, it’s so bad we’d probably suggest you find an alternative one to use unless you want your scope wobbling around precariously! It’s a minor flaw and not uncommon among manufacturers who include accessories; very often they’re not of a high enough standard. Just make sure you plan ahead and are ready with your own tripod for when you want to start using the scope. If you’ve been trawling through the Barska spotting scope reviews trying to decide on the right model, magnification is probably one of the key factors you’ve considered. It’s one of the most important aspects of buying a scope so it’s essential to understand just what you’re getting. Although this scope offers incredible magnification, it’s perhaps worth mentioning that visual acuity over 60x is not ideal. Due to atmospheric conditions, it’s incredibly hard to achieve good image quality for magnification above 60x, a fact borne out by the Barska spotting scopes review sites. Opting to use the scope at just 20x, you’ll benefit from a field of vision that offers 131 feet at 1000 yards. The higher you push the magnification, the lower this drops but it’s still very competitive compared to other spotting scopes of the same spec. Even though the Barska Blackhawk is well-priced, its light-gathering ability is excellent and the quality of its optics is high. This is partly due to the large size of the objective lens, but also because the optics are fully multicoated. This is the best option available for any scope and helps to deliver the crisp, sharp images which are typical for this scope. A Porro prism is used as the basis for this scope, a model which experts agree offers the best performance for the lowest price. The only thing that could have enhanced it further would have been the inclusion of premium grade glass, but that would have inevitably pushed up the cost. Nevertheless, the quality produced by what’s included is excellent and even at higher levels of magnification, the images are returned sharp and clear. Recommended Reading: How does this scope compare with the best? Find out in our guide to the top spotting scopes. 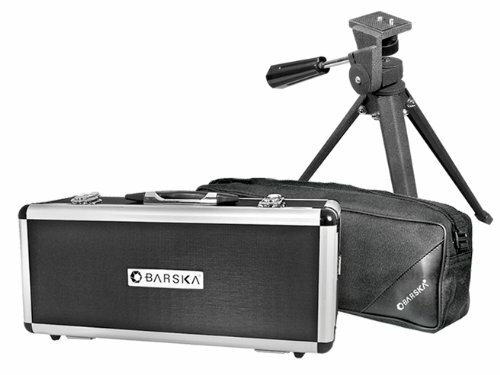 The two cases that are provided with the Barska scope help to provide protection while you’re on the move. If you’ve got your scope in the hard case, it’s going to stay well protected even if it sustains a few bangs along the way! However, even when you remove the Blackhawk from its case, it’s a pretty durable piece of kit. The exterior is made from a rubber coating which provides excellent protection against any knocks or drops. As well as being shock-resistant this rubber housing makes the scope easy to hold and grip, reducing the likelihood of accidents. The quality you get from using the scope won’t easily diminish over time. This is due to the resilience of the interior. The barrel has been purged with nitrogen, and it’s protected with O-ring seals to prevent grit, moisture or dirt getting in. All of this plus the guarantees of being anti-fog and waterproof means that it will deliver the same top-notch performance in all conditions time and again. If you read any Barska scopes review, you’ll see that ease of use is one of the primary features from this manufacturer and they’ve achieved the same again with the Blackhawk. It’s a lightweight design, weighing approximately 2.86lbs which makes it easy to carry around for use in the field. A sunshade is included in the angled design and this automatically reduces the glare from the sun. The focus wheel is sensitive and easy to use but simultaneously isn’t positioned so it can be accidentally knocked while viewing. If you’re looking for a spotting scope for use which provides you with an excellent field of vision and good quality images, it’s hard to find much better in this price range. The Barska Blackhawk isn’t suitable for digiscoping or astronomy but apart from this, the quality of the images are clear enough for all other activities, including rifle shooting. A manufacturer who has previously demonstrated that their scopes are built to last, Barska have created another excellent model in the Blackhawk which users are guaranteed to love. Make sure to follow Stealthy Ninjas on Facebook to see more informative guides like this on a regular basis.